← Where’s the Concern, Lobsters? 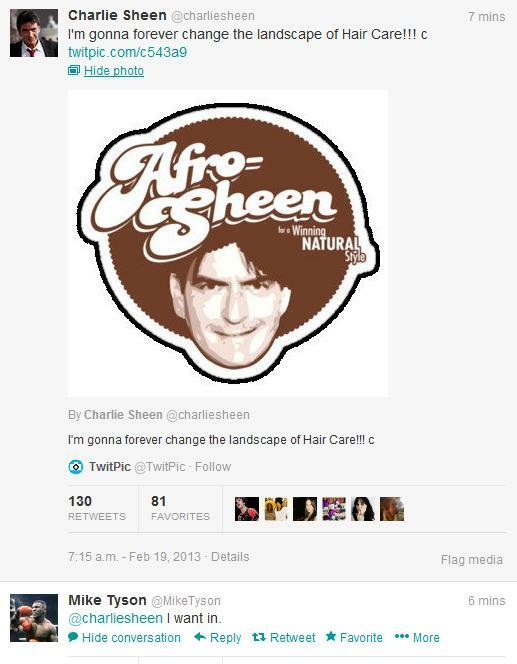 Charlie Sheen tweets some ridiculous photoshop of “Afro-Sheen” and almost immediately, Mike Tyson responds… “I want in.” Hahaha. What does that mean, Iron Mike? No clue, but I love it. This entry was posted in Boxing, Celebrities, Media and tagged afro sheen, Charlie Sheen, charlie sheen tweets with mike tyson, Mike Tyson. Bookmark the permalink.